Visitor volume is represented by overall visitors entering Alaskan waters and/or airspace. Between October 2016 and September 2017 Alaska had about 2.2 million visitors, 49% of those visitors being through the cruise industry. That 2.2 million was a 27% upgrade since 2009 and the volume overall has had a steady positive trend. Visitors generally spend money when travelling and this is measured in 2 distinct areas, the cruising companies themselves and the visitors. There are no current numbers for the cruise specific passengers spending ashore but the overall visitor expenditure can be measured. Tours accounted for $394 M (18%), Gifts and Souvenirs $427 M (20%), Food $428 M (20%), Transportation $258 M (12%), Lodging $454 M (21%), and Other $217 M (10%). The second main area of economic growth comes from what the cruising companies and their crews spend themselves. 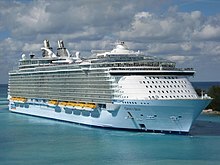 Cruise Liners spend around $297 million on the items that come in their packages on-board and ashore as parts of group tours, things like stagecoach rides, boat tours on smaller vessels throughout their ports of call. This money is then sent to the service providers through the cruise line company. Cruise liner crew is also a revenue generator with 27,000 crew members visiting Alaska in 2017 alone, generating about 22 million. 2017 was also a great year for job generation within Alaska, 43,300 jobs were created bringing in 1.5 billion in labor costs, and a total of 4.5 billion being generated. These jobs were scattered across all of Alaska. Southeast Alaska had 11,925 jobs ($455 M labor income), Southwest 1,800 jobs ($50 M labor income), South central 20,700 jobs ($761 M Labor income), Interior 8,500 jobs ($276 M labor income), Far North 375 jobs ($13 M labor income). Labor income is shown through the graph below.